Because the show is generated entirely by comment boards at this point, Community has welcomed yet another actor from a fellow, Internet-beloved cult series to its cast: Nathan Fillion, whose presence should spark whatever the web version of a hurricane meeting a snowstorm is, in the torrential merging of Firefly and Community references. Fillion will play Greendale’s head custodian, a “politically savvy” figure of surprising power who clashes with Annie and Professor Hickey, played by previously announced guest star Jonathan Banks. 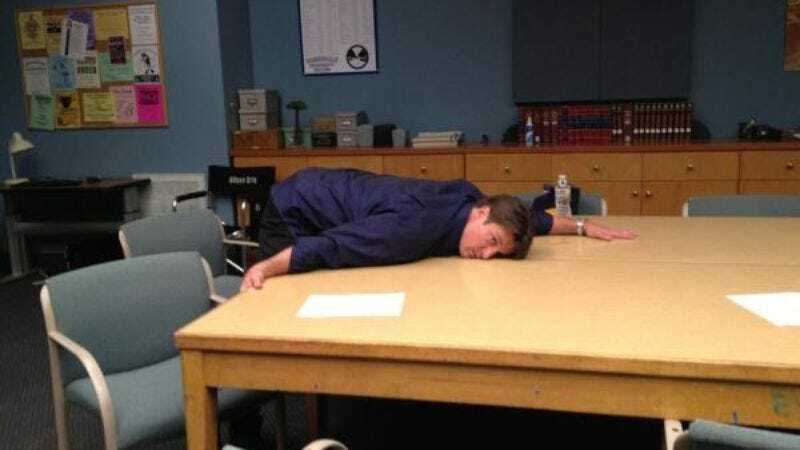 It’s the culmination of a long courtship, after Fillion posted a series of photos (including the one above) from his visit to the set last year, then traded various Twitter niceties with members of the cast—something lots of you may have done, only without also being Nathan Fillion. Though, given its continued commitment to fan wish fulfillment, expect Community to get around to casting you soon enough.